Address: I-96 and Milford Rd. I had been aware of this park, but only after it ceased operations and it had been my intent to photograph it. When I finally decided to make the ride, the place was completely gone and the land graded for something new. 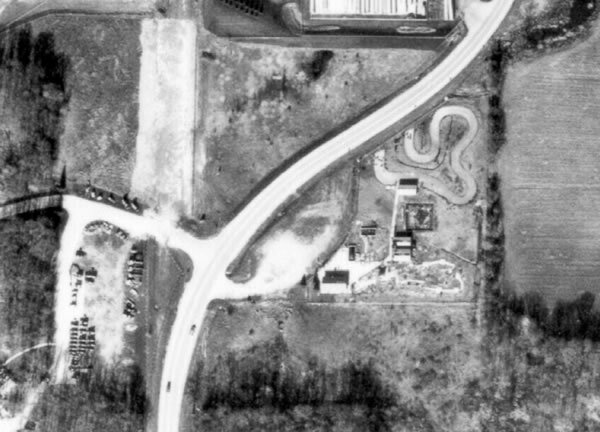 I am certain that the park was located on the site now occupied by the Hines Park Ford dealership. I worked at Michigan Water World for an entire summer in 1983. I had a lot of fun working there and the owners were really nice people. About once a week, the manager would let us stay after the park closed and ride the water slides. It was a great summer for me. It had boats too. I think they were bumper boats or something. I remember I wanted to ride them but my dad didn't want to pay extra. I worked for the company that supplied amusement games to Michigan Water World from the day it opened until its closing. We always enjoyed heading out to Michigan Water World, doing business with Ken and Terry, and had alot of fun there as well. That photo brings back alot of memories. glenn. I remember going there as a teenager around 1986. I thought that it was named Michigan Water World. This park was located off of the Milford exit of I-96. It seemed to be positioned to attract folks that were heading out to Kensington Park or Camp Dearborn. As I recall there was a water slide, which can be seen in the aerial photo. There was also a go-kart track and maybe some batting cages and other various games. The park closed after a few years in operation and sat dormant, the only activity being a Haunted House attraction around Halloween that was enclosed in a semi-trailer parked on the lot. Eventually the interchange was re-routed and there appears to be a storage lot there for heavy construction equipment where the park once stood. I will visit it soon to see if there is any remnant of the old fun park left.